Government offices and most large companies told staff to come to work one hour later than usual in an effort to keep the roads clear for students heading to the 1,257 test centers across the country. Vehicles were banned from roads within 200 yards of a test center, while the defense ministry had made sure in advance that the air force would not be conducting flights and that the army – presently engaged in large-scale manoeuvres – would not be carrying out artillery drills. The transport ministry went as far as to impose a ban on flights landing or taking off from the nation’s airports during the 40-minute period that students were taking the English language listening test. 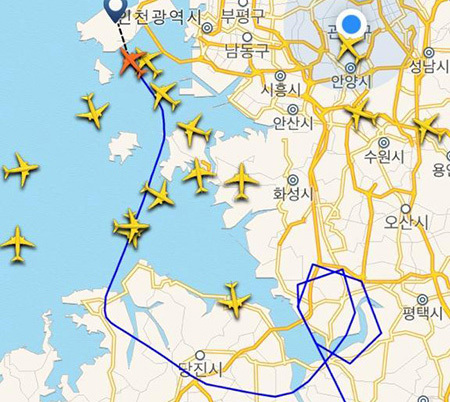 A captured screen of the inbound flights coming towards Korea’s international airport has gone viral online, showing the planes flight paths as they circled the airport to bide their time. High school seniors on Thursday took the College Scholastic Aptitude Test (CSAT). The planes were delayed around the time the English listening section of the exam was held. And for those who slept through their morning alarms because they were getting in some last-minute cramming, help was at hand. Students who feared they were not going to be able to get to their designated test center were able to call an emergency number and request assistance from the police, who had a fleet of police cars and motorcycles on stand-by. Education is a deeply important part of Korean society, with AFP reporting that parents spent nearly $17.2 million on extra tuition for their children last year. 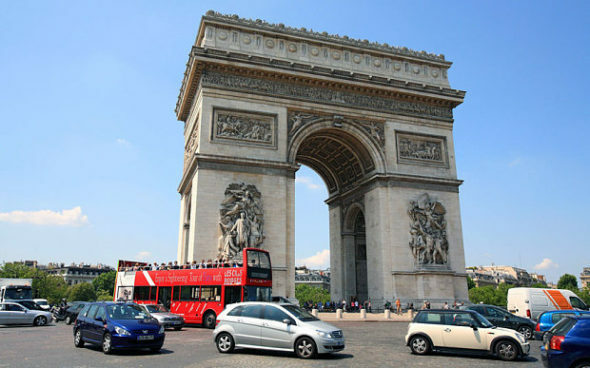 In France, there are a limited number of driving tests open to prospective drivers each year – and the government allocates them to driving schools, not individuals. So candidates have to “beg to get into the classes, beg to get into the exam. You’re not treated as a client, you’re treated as a conscript,” says Gaspard Koenig, a former speech-writer for the former finance minister, Christine Lagarde, who has written an entire book about it. Not a book about how to pass a driving test – a book about how to get a driving test. The driving schools with the biggest quotas can afford to be as selective, and as expensive for the amount of tuition they offer, as some top universities. It is the driving schools, not the candidates, who decide when learners take the test. Their quotas depend to some extent on their pass rate, so they have every incentive to hold back weaker students. French candidates are recommended to take at least 40 hours of lessons and are required to take 20 hours. Most end up doing far more than that while they wait for the school to let them take a test. “They’ll tell you, ‘OK, we’ll put you up for it in August, but on condition that you take 20 more hours’ lessons than you need’,” says Mr. Koenig. Many students find themselves paying €3,000 ($3,750) before they are done. As well as having to take more lessons, each one usually costs up to twice as much as in Britain. Qualified instructors are not allowed to set up on their own. They have to work in driving schools. And driving schools are one of 37 state-protected professions or industries, essentially closed shops able to charge more for their services than they could in an open market. But the result, in this particular case, is not just expense, bad service and hassle. It is that millions of people, particularly young people, are shut out of any job which requires them to use a vehicle, from pizza delivery driver to tradesman. Hundreds of thousands more, particularly in the countryside, cannot take any work where public transport is not available and they would have to commute by car. Youth unemployment in France is 24 per cent, and this is one of the reasons why. Every [presidential administration] for years has promised to sort out the mess. French [leaders] have been pledging to tackle the protected professions since 1791, shortly after the revolution, a century before the car was even invented. Colombian President Juan Manuel Santos has suspended peace talks with Marxist Farc rebels following the kidnapping of an army general, throwing into crisis the nation’s efforts to end 50 years of war. General Ruben Dario Alzate, who heads the Titan task force in the Pacific department of Choco, was captured on Sunday afternoon by the Revolutionary Armed Forces of Colombia (Farc), along with another military official and a civilian. 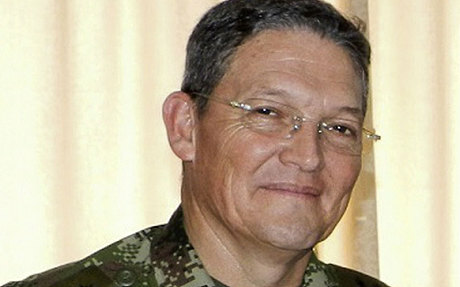 Gen. Alzate was captured after disembarking from a boat on a river near the city of Quibdo, during a visit to an energy project, Defense Minister Juan Carlos Pinzon said. Another official and a lawyer travelling on the boat were also captured, although a soldier at the wheel of the launch managed to escape and inform the authorities. Mr. Santos had publicly warned the Farc, formed in 1964 to fight for rural land reform but now involved in the drug trade and countless kidnappings, that it risked jeopardizing the peace process after the abduction of two soldiers last week and continued attacks on infrastructure. The rebel group has stopped kidnaps for ransom but maintains that military personnel are fair targets in the absence of a ceasefire. Gen. Alzate entered the area in a civilian capacity, breaking security protocol, Mr Santos said. He was not accompanied by bodyguards. Troops will be sent to the area to attempt to rescue the three captives, the president said. The government will also work with the International Committee of the Red Cross for their release. Farc leaders in Havana have occasionally dissociated themselves from violent attacks by lower ranks in Colombia, raising the possibility the high command could defuse tension by securing the general’s release. The halt is not the first time the two-year-old talks have been suspended. The Farc stopped them in August 2013 to review the government’s plan to put any peace deal to a referendum. Negotiations resumed several days later. The Farc and government negotiators have reached partial agreement on three of the five points of the agenda for the talks, including land reform, the drug trade and political participation for the rebels. 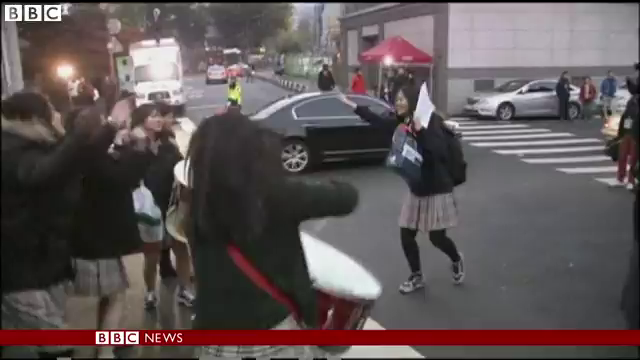 b) List the actions taken to ensure South Korean students would not be disturbed by noise during their exams. c) South Korea is a much smaller country than the U.S., in size and population. Should it be possible to do so here, would you want the government and businesses to take the same actions on the day the SATs are given? Explain your answer. b) What motives do driving schools have to require students to take extra lessons? Be specific. Driving schools are one of 37 state-protected professions or industries in France, essentially closed shops able to charge more for their services than they could in an open market. Although a government analysis found that driving schools’ monopoly “offered no obvious benefit to the consumer or public safety,” the union is so powerful even the previous president could not reform the system when he tried. Describe the problems people face in this type of system as they struggle to obtain a basic drivers’ license. b) President Santos’ government has been involved in peace negotiations with FARC for 2 years. What information from the “Background” below the questions would lead you to believe that any peace deal FARC leaders make with the Colombian government might not end all illegal FARC activity? One foggy morning last November, officer Kang Jin-jin heard the distress call on his police radio: An 18-year-old girl about to take the national college-entrance exam had left her admission ticket at home. Mr. Kang’s heroic effort is hardly an isolated one. On the day each November that high-school seniors take the college-entrance test — Nov. 13, this year — South Korea is a changed country. Many offices and the stock market open at 10 a.m., an hour later than usual, to keep the roads free for students on their way to the test. All other students get the day off to keep schools quiet for the test takers. And while students are taking the listening portions of the tests, planes can’t land or take off at the nation’s airports. Aircraft arriving from other countries are ordered to circle at altitudes above 10,000 feet. If all this sounds excessive, some college and government officials agree that it is. This year, the government gave money to 40 universities to hire admissions officers whose role more closely resembles those in Western countries, where standardized test scores are just one of many considerations in college-admissions decisions. “I think focusing too much on the one-day test should be changed,” says Yu Myung-cheol, vice president for admissions at Kyungpook National University in Daegu. But the introduction of the admissions officers, essays and other criteria to the college-entrance process brings subjectivity to a system that many Koreans consider objective and fair. South Korea strives to maintain equality throughout the educational system. Admission to private elementary schools, for instance, is determined by lottery. 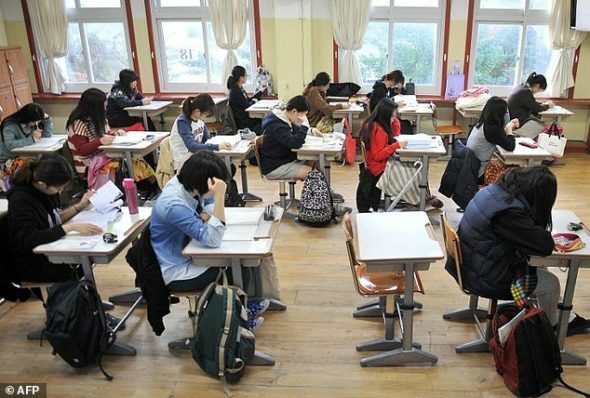 “To many South Koreans, the admission tests are something that should always remain fair because education is the last fortress through which everyone, regardless of their current status, can ascend to a higher social status,” said Choi Set-byol, a sociology professor at Ewha Womans University. Indeed, South Korea’s Education Ministry goes to extraordinary lengths to keep the national entrance test fair. Every year, it chooses about 400 teachers and professors to prepare and review questions, and it sequesters them all for weeks in a resort surrounded by police. Cellphones and Internet contact aren’t allowed. What phone calls that are allowed are monitored. The brain trust can’t leave until after the test is finished. With the test preparers’ sacrifice held out as an example, other South Koreans are quick to do their part to make sure the test goes smoothly. Korea Electric Power Corp., the national utility, places about 4,000 crew members on standby for power emergencies. It checks every power line that goes to the roughly 1,000 test centers, and it dispatches at least one engineer to monitor each of these lines that day. As exam day nears, nervous students say they are concentrating on just getting it over with. Kim Nam-mee, a high-school student in southern Seoul, spends her waking hours studying but is also making an effort to get seven hours of sleep. “What I need right now isn’t so much studying but to maintain my best condition,” says Ms. Kim. “I just think I should do my best at this test and get admitted,” she adds. Ms. Kim’s mother, meanwhile, shuttles her from home to cram-school, wears headphones when she watches TV so as to cut down on the noise, and prays at a Catholic church. Other parents go even further. On a recent chilly Saturday evening, Kim Nam-seon joined more than 1,000 parents in an airy southern Seoul temple for an intense overnight praying session. Her mission was to bow 3,000 times, kneeling down with her forehead touching a red cushion on the ground to bring luck to her son, who attends a technical high school. For a driver, which is safer: to crash into a wall behind the wheel of a car, or to crash into it at the controls of a tank? In France, around four million would-be drivers are waiting their turn to be asked questions like this. Getting a licence can take as long as two years, and cost more than buying a second-hand car. The one change which would make a real difference – liberalization [deregulation] – is severely stuck in traffic. For the last year, Benjamin Gaignault and Alexandre Chartier, two business school graduates, have been trying to break the chokehold of driving schools. Their start-up, Ornikar, uses the web to match instructors and students – who can do the theory test online. It takes advantage of a little-known rule in the driving code that allows learners to sign up for the test themselves. But, as their website sadly confesses, Ornikar still lacks a driving licence of its own. The regulations say that any driving school has to be approved by the prefecture, the government’s local office. A countdown clock on the website lists the number of days – 333 – that have passed in total silence since they put in their application. The prefecture is not taking their calls, nor The Telegraph’s. “We have heard nothing for almost a year. They are hoping we will run out of money,” says Mr. Gaignault. As the…standard-bearers for a frustrated generation, he and Mr Chartier have had a great deal of French media attention. They have been to the Elysée, the president’s office, to the Treasury, to other parts of the government. The authorities are in consultation with the driving schools about changing the rules, but no action seems imminent. “They’re worried the driving instructors will take to the streets,” says Mr. Gaignault, just like the taxi-drivers did when former President Sarkozy tried to liberalize [deregulate] them. Even before Gen Alzate’s kidnapping, frustration with the slow progress of peace talks taking place in Cuba and the guerrillas’ refusal to wind down attacks has been building, especially among conservative critics who allege Santos has been too lenient with the insurgents. Just this month, the FARC captured two soldiers following intense fighting in northeast Colombia — it has since offered to free them [but hasn’t done so] — and killed two Indians who confronted rebels hanging up pro-rebel banners on their reservation. The FARC swore off kidnapping of civilians in 2012 but considers captured military personnel prisoners of war. It also has been clamoring for a cease-fire while peace talks continue, something Santos has rejected for fears it would allow the guerrillas to regroup after years of battlefield defeats at the hands of Colombia’s US-backed military. The FARC’s 34th Front is among the group’s most entrenched and dangerous fighting units, based in the dense, water-logged jungles around Quibdo where a slew of criminal gangs and drug-traffickers also operate. Its fighters refused to abide by unilateral ceasefires declared by the FARC leadership in Havana during elections and Christmas holidays. That could complicate any attempts by the FARC’s top leadership to win his release. A spokesman for the FARC in Havana declined to comment, saying the rebels’ negotiators were still investigating the incident. Santos, who was re-elected in June, has staked his presidency on reaching a deal with the FARC. But he’s struggled to overcome doubts from conservative opponents and members of the military who fear he’s ceding too much power to rebels behind scores of atrocities. President Santos has been in peace negotiations with the FARC; his predecessor President Alvaro Uribe opposed negotiations with FARC and said they should be held accountable for their terrorist/criminal activities. FARC is responsible for most of the ransom kidnappings in Colombia; the group targets wealthy landowners, foreign tourists, and prominent international and domestic officials.